It’s the Saga Prefecture’s official page. What is awesome about the website is the DESIGN. Please look at this first. “Seeing is believing”, right? 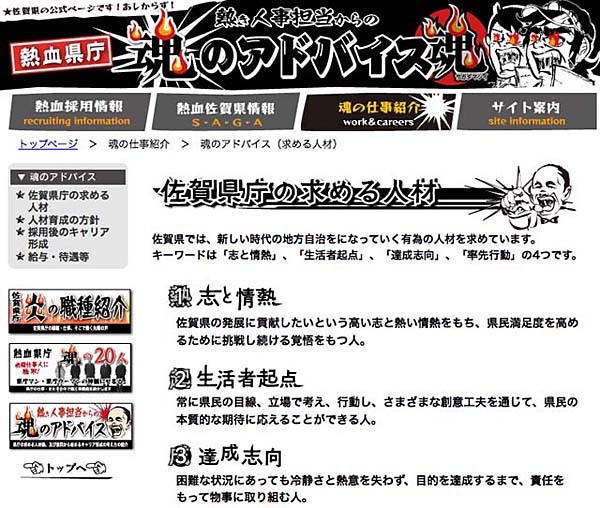 It’s their recruiting page for new Prefectural Officials. In Japan, most of Prefecture’s official websites are serious with sensible designs; however, this site looks casual with manga, and really amazed me when I first saw it. It’s neat that the eyes of the man and woman on the top are on FIRE. The kanji covered with fire is “魂”, which means “Spirit”. The illustration straightly shows the Saga Prefecture’s eagerness to “hire people who work hard with passionate spirits”. This page tells the kind of people they want. Looking at such website, I was wondering what the Prefectural Governor of Saga is like, so I checked the governor’s introduction page, which was impressive to me. In the real world, there is time limit but one is allowed to look up in a book, search on the internet, or ask someone. The more important thing is to know who can answer ones question. Nowadays, computers can answer the easy questions that are on a paper test. That is what the governor thinks, so he wants the person who has the ability to “manage well what only humans can do”. It is very interesting thought. Lately I don’t see the Japanese who has guts and enthusiasm so often. 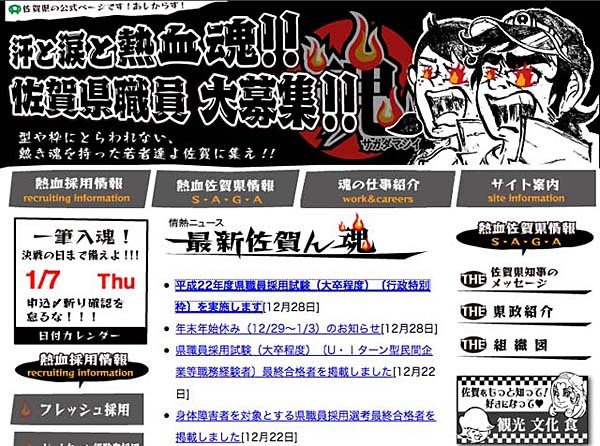 This [W:Saga Prefecture] website reminded me burning spirit, which I am very glad at.